Handmade Ladies 14k Yellow Gold St. Brigid’s Celtic Cross hallmarked at the Irish Assay Office in Dublin Castle. Handcrafted in 14k yellow gold, the wonderful detail of this Celtic pendant accurately captures the detail of a traditional Saint Brigid’s Cross. Measuring 20mm high and 17mm wide (including bale) the cross comes fitted with an 18 inch 14k gold chain. Handmade and hallmarked at the Irish Assay Office in Dublin Castle with free shipping from Ireland. Along with Saint Patrick and Saint Columba, Saint Brigid is one of Ireland’s patron saints and lived from 451 – 525. Making a St. Brigid’s cross is one of the traditional rituals in Ireland to celebrate the beginning of early spring, St. Brigid’s Day is also the Pagan festival of Imbolc and it is said that legend of St. Brigid stretches back to pre-Christian times and The Saint was originally Ireland’s most revered Celtic Goddess and there are many legends and folk customs associated with her. 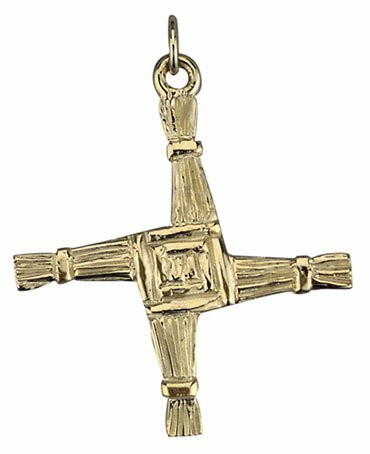 Saint Brigid’s Crosses are made of rushes that are pulled rather than cut. They are traditionally hung by the door and in the ceiling to protect the house from fire and evil. According to tradition a new cross is made each St Brigid’s Day, and the old one is burned to keep fire from the house. Many homes have several crosses preserved in the ceiling the oldest blackened by many years of hearth fires. Some believe that keeping a cross in the ceiling or roof is a good way to preserve the home from fire which was always a major threat to roofs made from thatch. St. Brigid and her cross are linked together by the story that she wove this form of cross at the death bed of either her father or a pagan lord, who upon hearing what the cross meant, asked to be baptized.